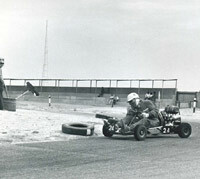 Historic petrol-engine kart racing in Kuwait during the 1960s. Homepage. 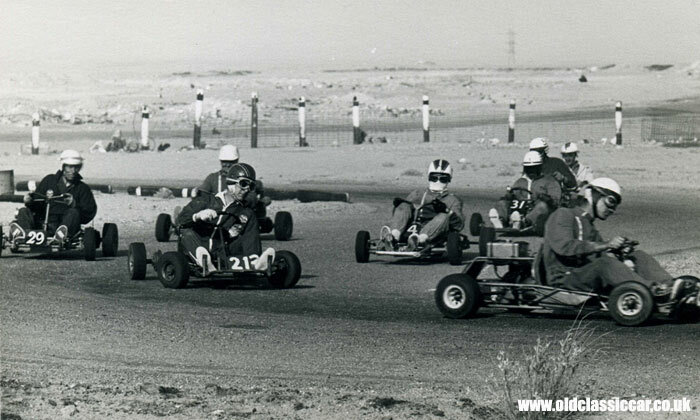 This page: A collection of images featuring classic kart racing in Kuwait from years ago. 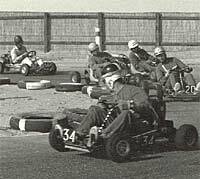 Racing karts in Kuwait, 1960s. 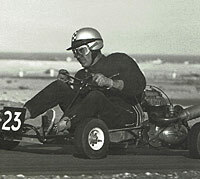 I purchased a small collection of historic kart racing photographs a little while ago. 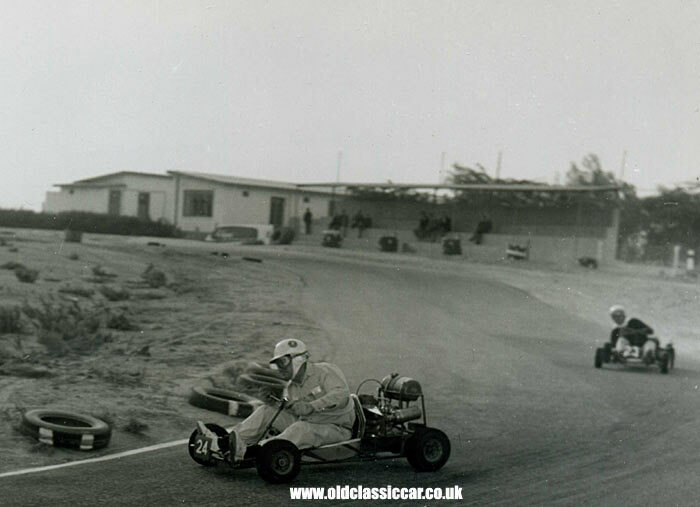 Judging by the road cars visible in the background of a couple of photographs, and some of the oil cans visible in the kart paddock, I dated these either to the late 1950s, or more likely, the 1960s. The races aren't in Britain, the registration plates on the road cars back this up. 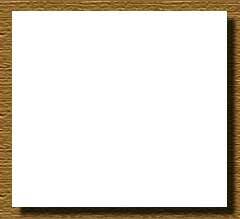 The only clue is printed on the rear of one photo, which advises that this one print was done at Photographic Services, in Fahaheel, a suburb of Kuwait. 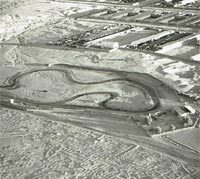 Happily, a few years after first publishing this page, one of the original instigators of this race track contacted me - of which more further down the page. 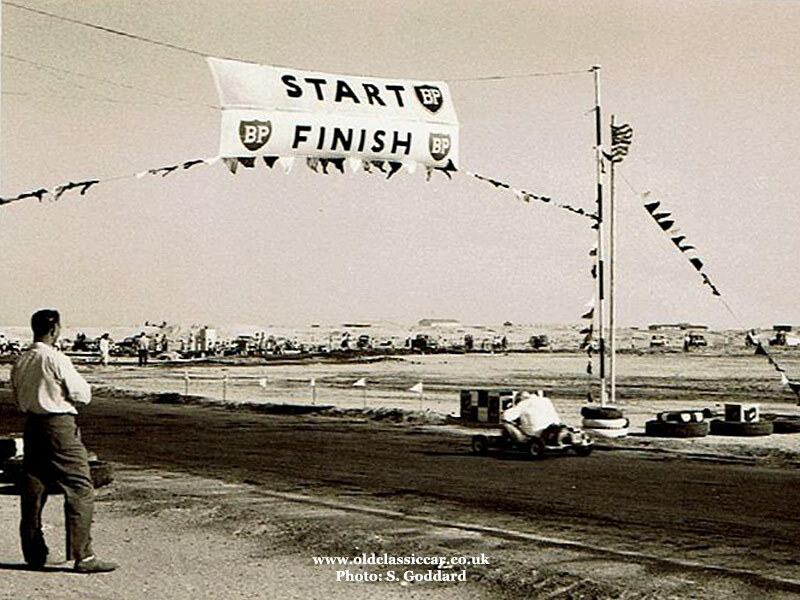 There was a karting club at RAF Khormaksar, run by the Khormaksar Go-Kart Club, with races being held on the airfield, using beer cans or boxes to mark the course. 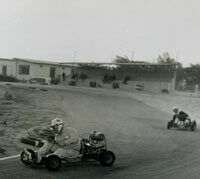 The kart races featured on this page though appeared to be on a purpose-built track, as it later proved to be the case. 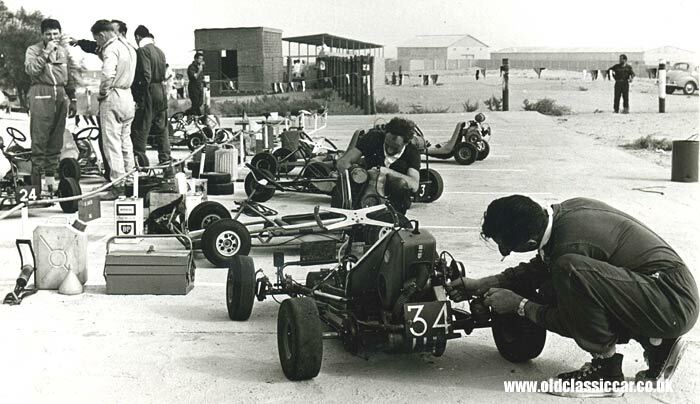 Photograph number one is a paddock scene, with several petrol-engined go-karts being worked upon prior to a race. 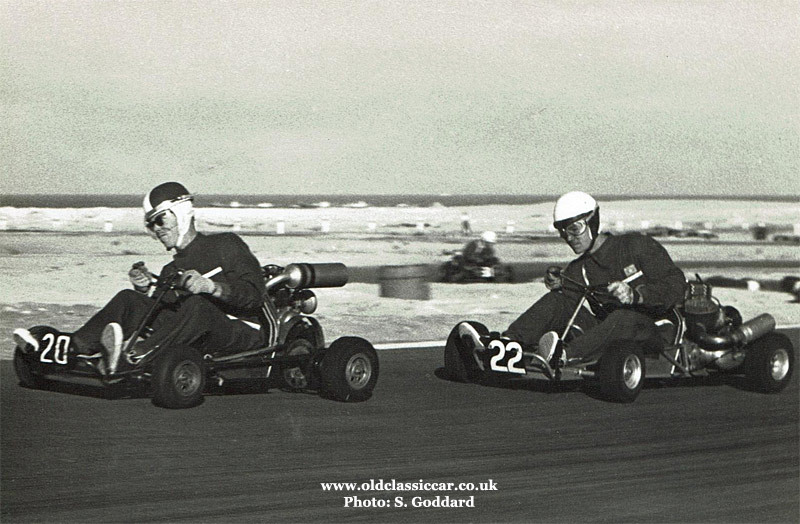 The chap in car number 24 appears in several of these photographs, which makes me think it was one of his gang that took these shots. A parking area for road cars is in the background, with examples of Mercedes-Benz, Standard, Peugeot and Borgward in evidence. 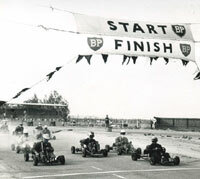 A second photograph also features the paddock/pits area at a race meeting. 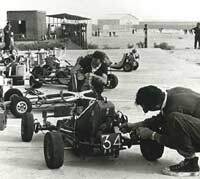 Kart number 34 is being worked on in the foreground. A close look at the engine cover reveals an Aprilia badge, confirming the source of this kart's motor. A "Shell" sticker can be made out on the next kart's engine cover. All around are the tools of a mechanic's trade, namely toolboxes, petrol tins, oil cans (one of which is for BP Energol Motor Oil), and a foot pump. Although not clear in this scan, a medical box is hanging to the rope fence close to the BP oil can. The name Smith is written on it, with a first initial (that might be J, L, or I). 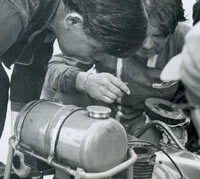 A close-up photo captures mechanics studiously peering into a kart's single-cylinder engine. Various action photos are included in this selection. 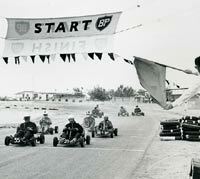 Firstly, a shot of the cars gathered on the grid awaiting the fall of the starter's flag, positioned beneath a BP-sponsored Start / Finish sign. Row one has cars 35 and 29 lined up on it, with 28, 6, 20, 30, 32 and 19 also visible. 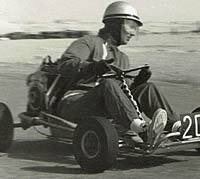 The driver of kart number 28 is caught on film, negotiating a high-speed left turn. A marshal, with flags close to hand, looks on. 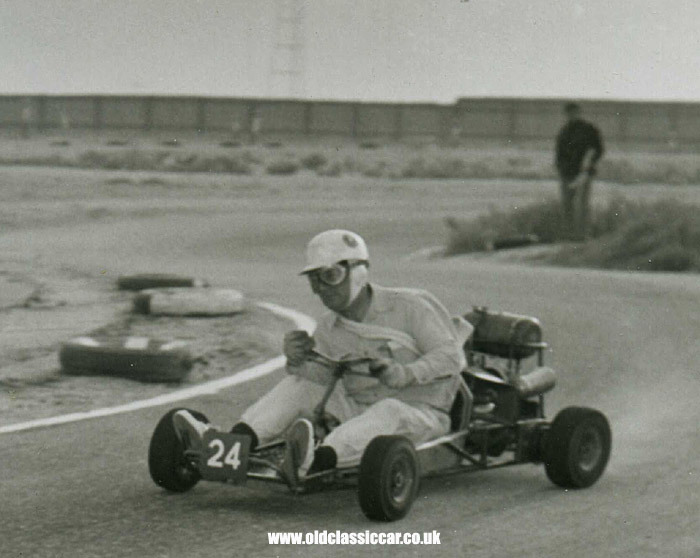 Driver of kart number 24 is shown next, drifting his steed around a tight right-hander, avoiding the cunningly-placed old car tyres, positioned to prevent drivers cutting the corner. 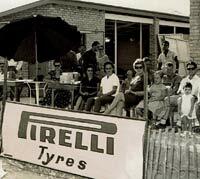 A Pirelli-logo'd marker sign can be seen to the right. 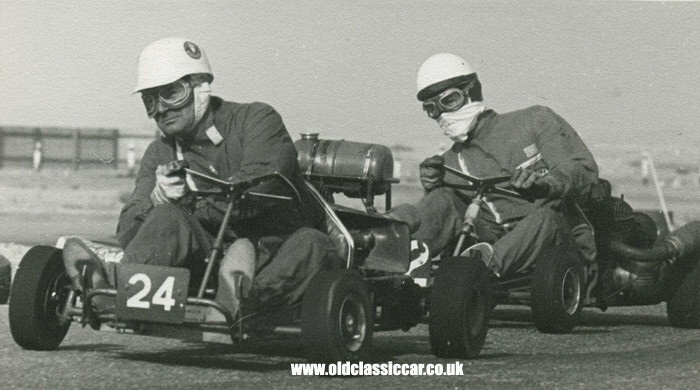 A further selection of classic karts in action from the same set of 1960's photographs. 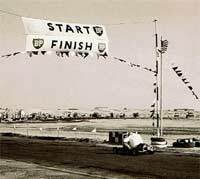 The first of this next batch is a view of the start/finish line, with the competitors lined up ready for action. Again there are no definite clues as to the exact location or date of these images. 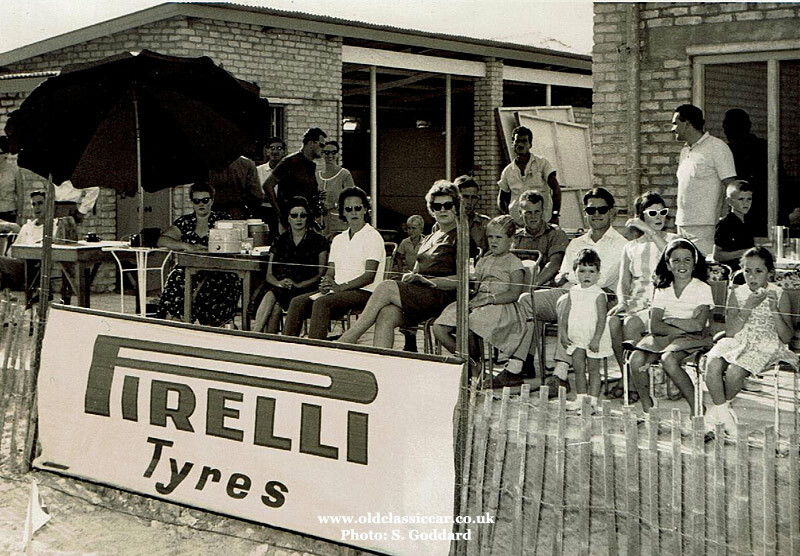 A simple grandstand can be seen in the distance, as can a Pirelli tyres sign and another advertising Renault cars. 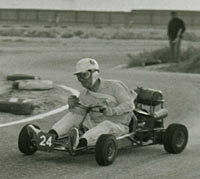 Kart 21 is on pole position, with number 24 - the focus of many images here - close on his tail in second position. 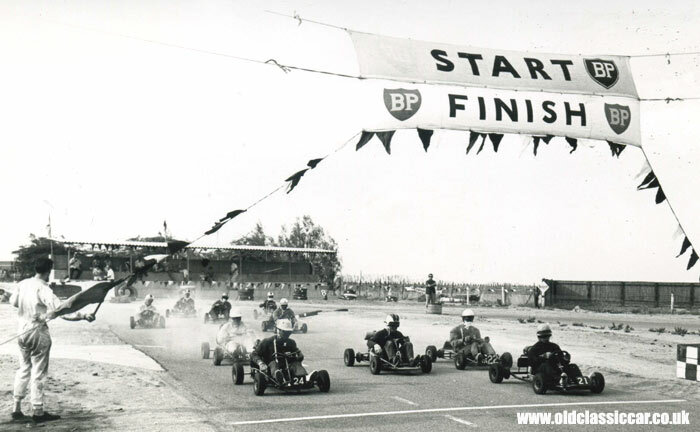 The race starter, in oily overalls, stands to the left ready to let the race commence. Is this the same circuit as that shown above? I suspect it could be, albeit run in the opposite direction. 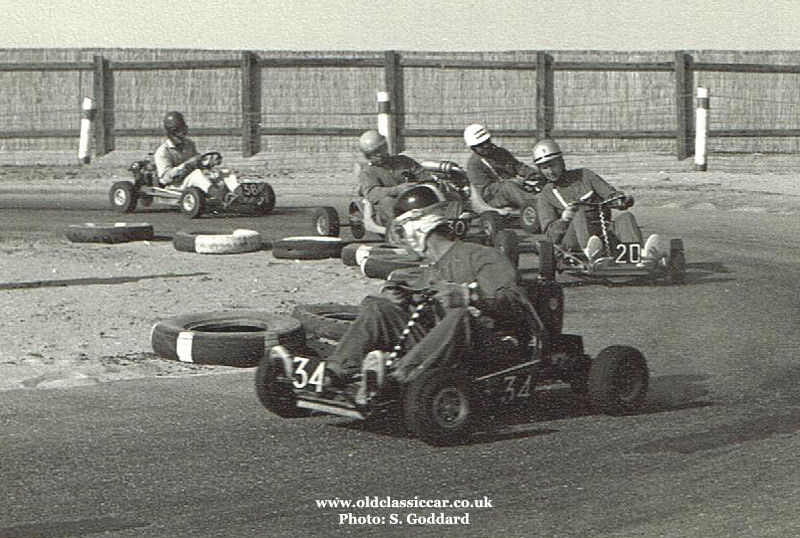 Eight karts are in shot here, battling wheel-to-wheel through a series of bends. 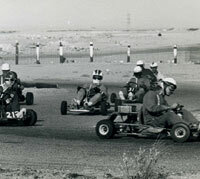 The dusty arid landscape in which this kart circuit was located, can clearly be seen in the background. Entrants number 24 (again), 22, and 3 are seen in action next. 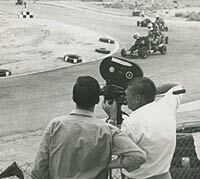 A group of gents - perhaps the race stewards - can be seen in the background, sat at a table watching the race unfold. 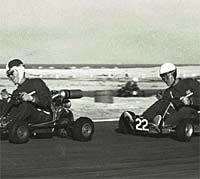 The next photo is my personal favourite on this page, as it zooms in on kart 24 while being hotly pursued by number 22, its driver wearing a scarf over his mouth. 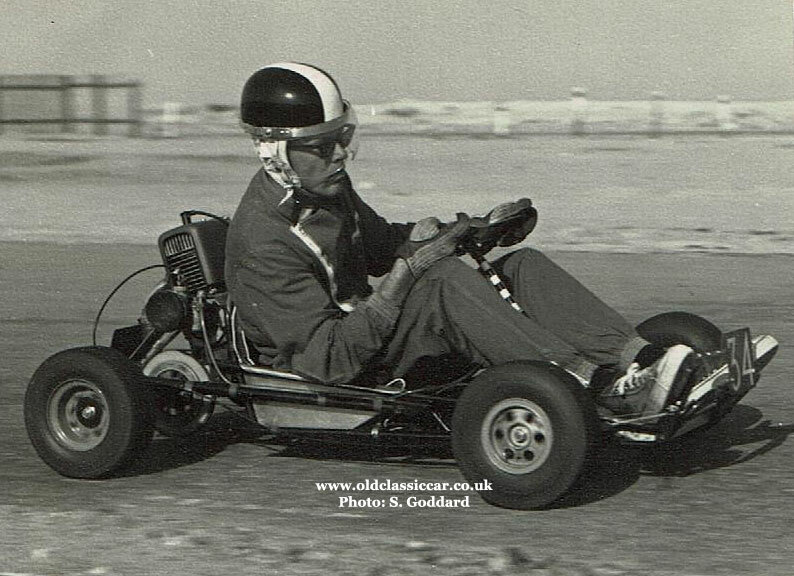 The front driver leans into the bend, holding the steering wheel with just one hand, while the driver behind applies a dab of opposite lock as his kart drifts through the corner. 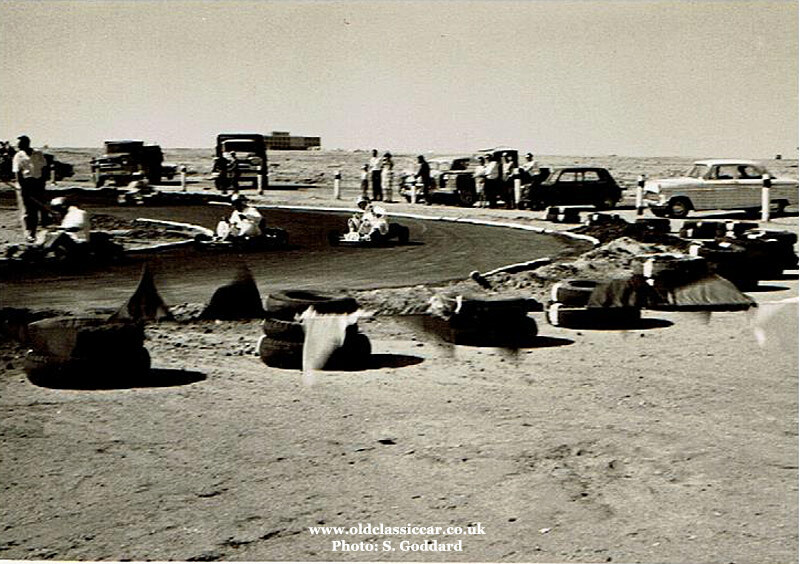 The word "Avon" has been written on the rear of this photograph, is this a reference to the track, the tyres being used, or one of the drivers shown here? 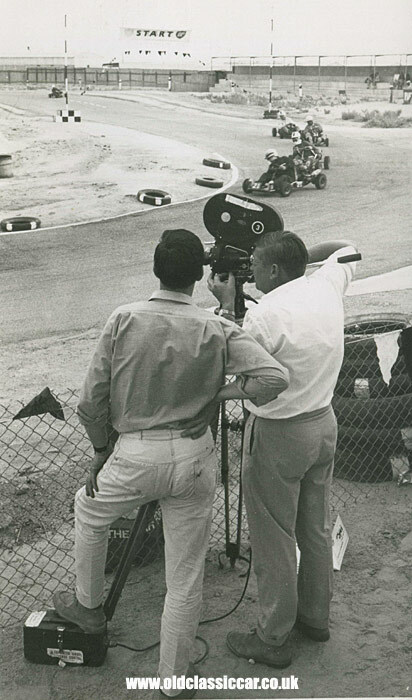 A local television company records the on-track action using an Arriflex film camera shown below. The chap to the left is resting his left foot on a power pack in use by the camera, on it is a sticker stating "EXPORTED UNDER REVENUE CONTROL". A bag on the ground in front of him, beyond the wire fence has something written upon it, possibly The Air Force. 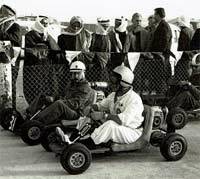 The final two photographs are slightly larger prints, one of which was developed at the photographic establishment in Kuwait. Driver #24 again features, although now he's in lighter-coloured overalls which suggests a different meeting. 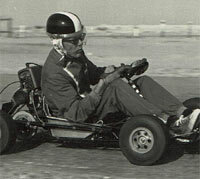 The photographer has captured the driver holding a gentle slide as he negotiates a right-hand curve. Note the tall radio mast in the background. In the original un-cropped image there is a large building - maybe a hangar - to the left in the far distance. 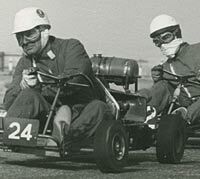 Last of all, another shot of kart number 24, here being chased down by number 23. 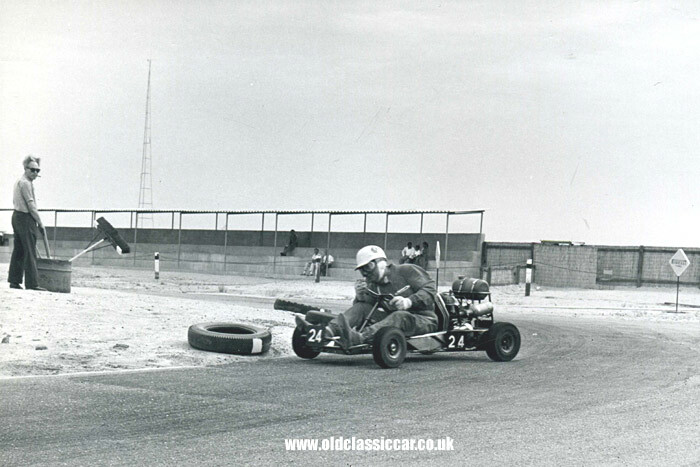 If anyone can confirm where these classic karting photos were taken, please do get in touch. 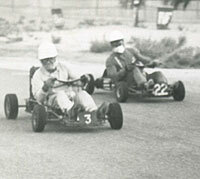 More details regarding Class 1 and 2 kart racing in Kuwait. Five years after first publishing this page, Simone Goddard sent an email over. 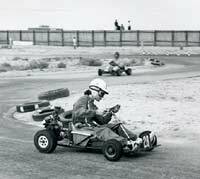 Her and her husband Nick were the drivers behind the instigation of the above kart racing club in Kuwait, as she now describes. 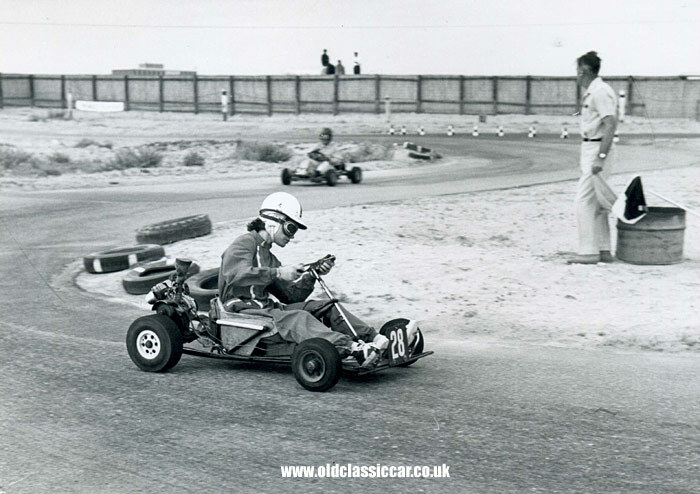 "I have just come across your article together with photos of karting in the early days .... maybe Kuwait? You are correct in your assumption. 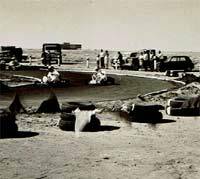 My husband and I were in Kuwait at that time, and it was him who instigated the setting up of a track and club! I can provide you with fuller detail and maybe more photographs with names if you are interested. I look forward to hearing from you. My husband passed away a few years ago ... 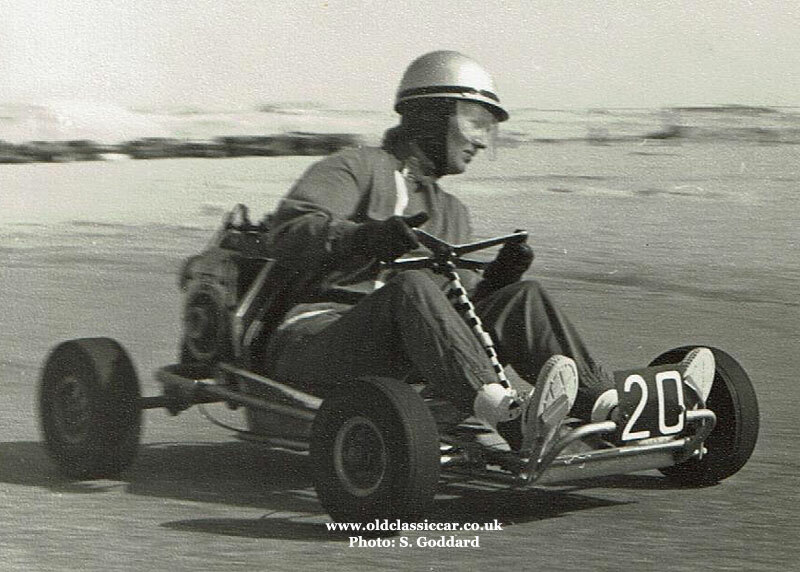 I am 80 years young ... still have fond memories of racing kart number 20"
"Further to my last message I will tell you a little more about Kuwait. 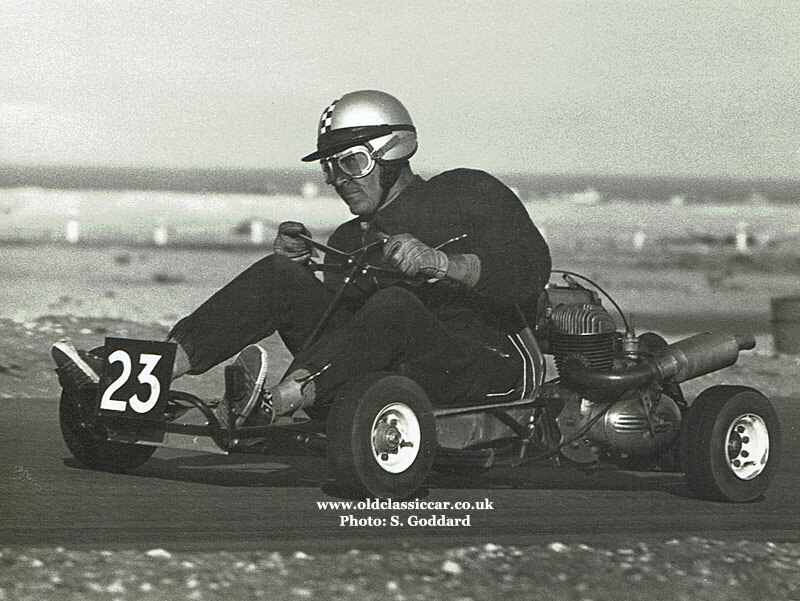 I think it was 1961 when we were on annual leave from the Kuwait Oil Company (KOC), we were with my family in Jersey and discovered that there was a brand new kart club just formed ... this inspired Nick to do his best on return to Kuwait to see whether it would be possible to do the same there. 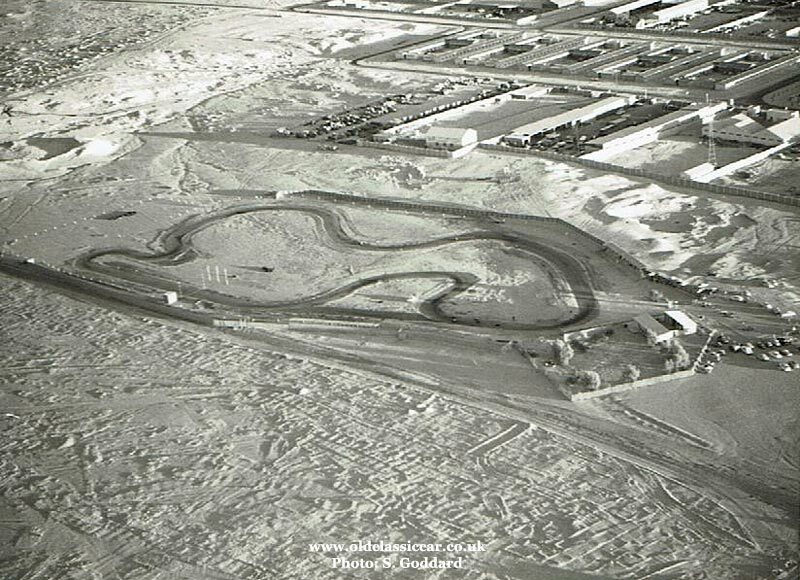 He got a few friends together ... they approached the company which then allocated a piece of desert for this ... the boys designed a track ... KOC tarmacked it for them. They were given the old pony stables nearby to create a club house. Appropriate fencing was erected in order to provide a viewing area for families. 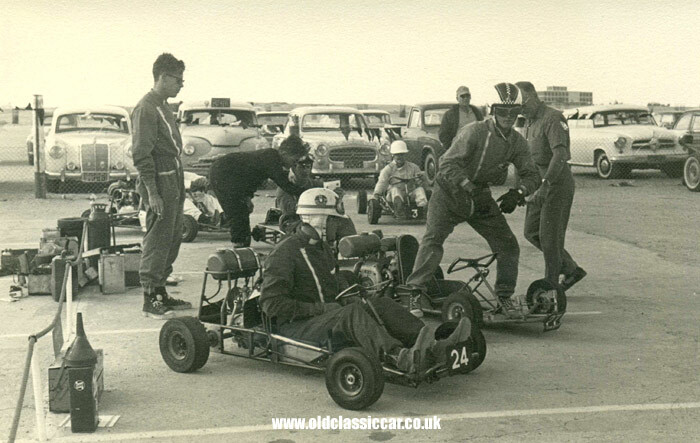 We started with a Class 1 kart (no.20) which subsequently became mine when Nick bought himself a Class 2 kart. 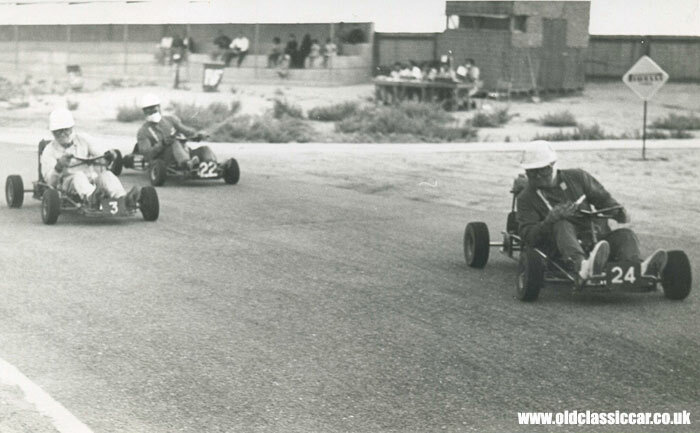 There were only three ladies who raced, so we were always racing against the men! We held our own on many an occasion ... I have a silver jewellery box to substantiate that statement! 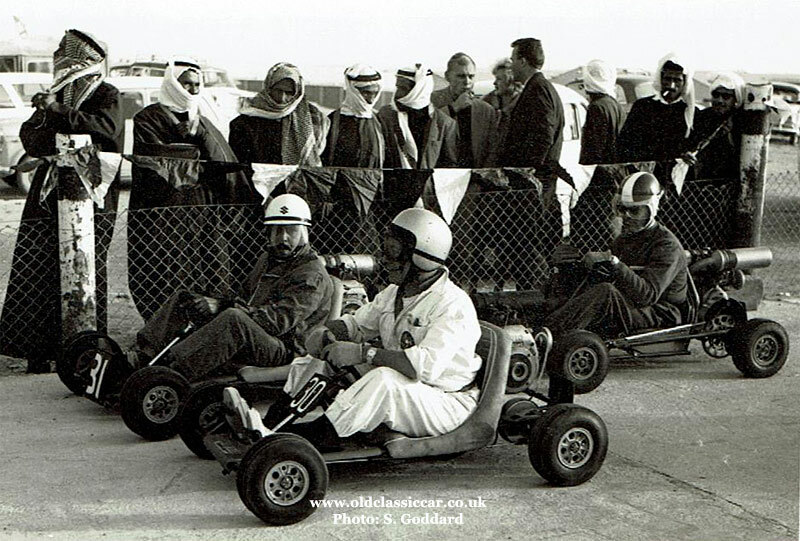 I left Kuwait to return to the UK in 1964, and Nick followed in 1965. 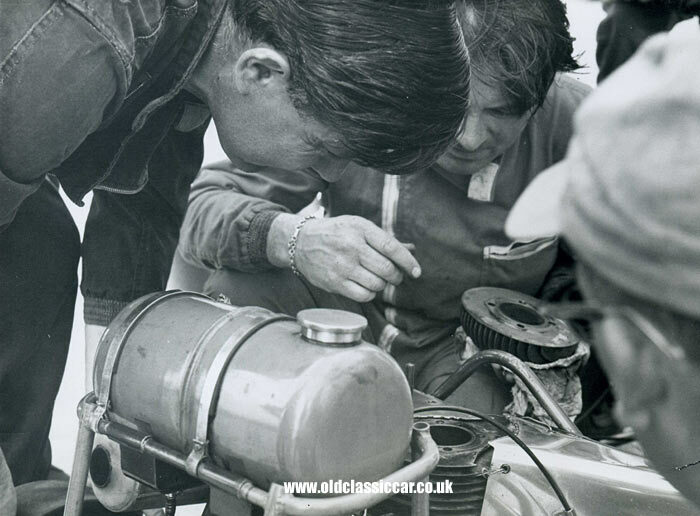 I think during that year viewing stands were installed, I cannot be sure exactly when." 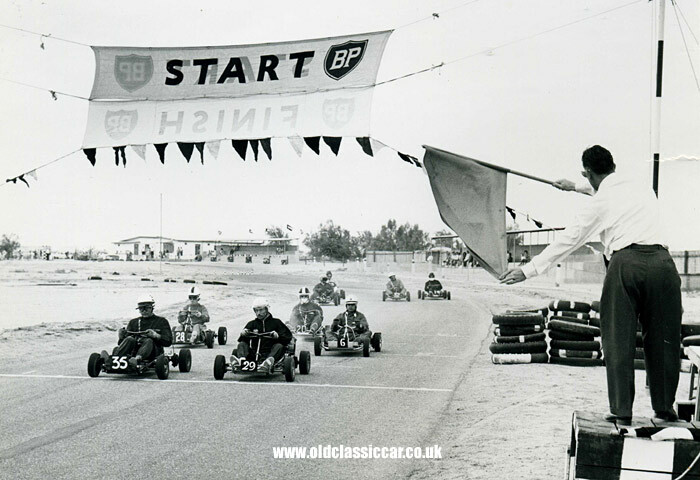 Brilliant to hear from you Simone with your memories of setting up the kart racing club, and competing in events there. The photos shown below were also supplied by Simone, many thanks for sending them over. 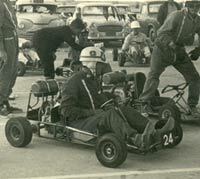 The first photo shows Simone at the wheel of Class 1 kart number 20. Return to Page 15 in the gallery of vintage cars and vehicles.